French | Rollo Whately Ltd. This frame is probably English. But it looks French, and (because we had to try it on one, of the rearing-man-on-a-horse variety) looks very good on French paintings. 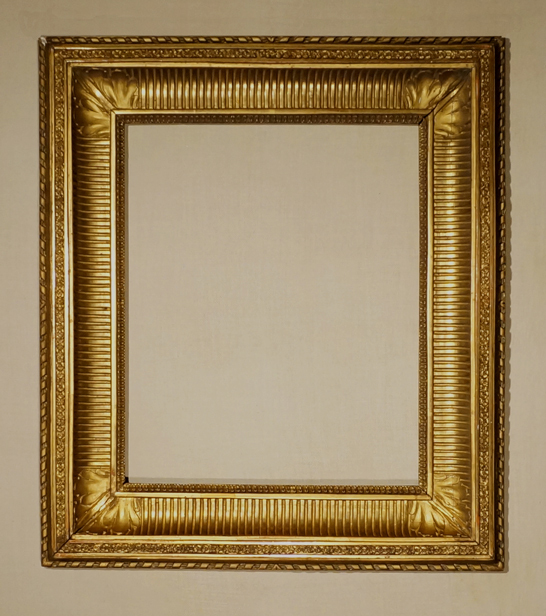 The size is typically English (30 x 25″) and the gilding also typical of English gilding of the early 19C. It is a good example of how well framers in London could imitate the French styles. 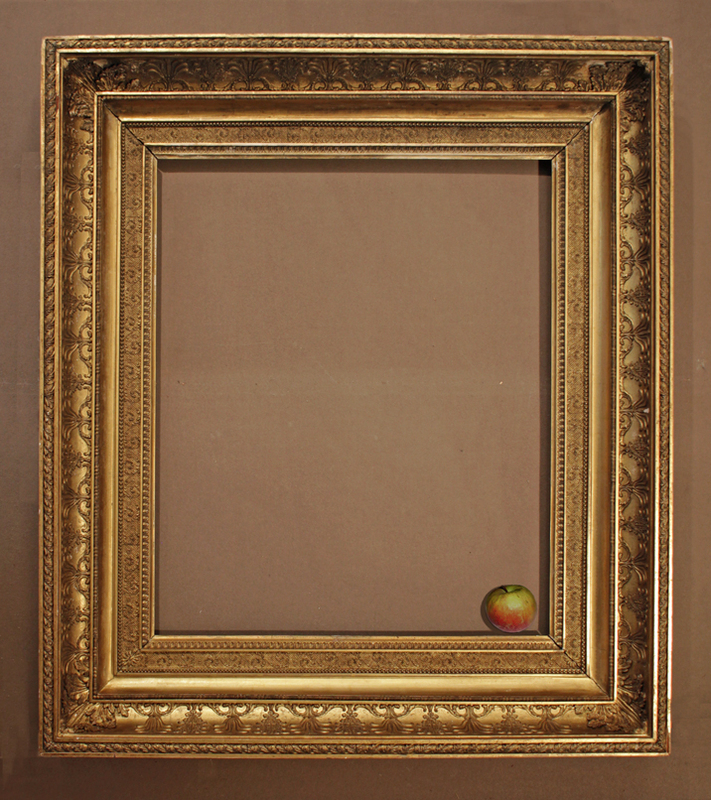 Without the apple, which is a variety originating in the Netherlands, it is impossible to imagine the scale of the frame from a photo – it is quite a chunky one! 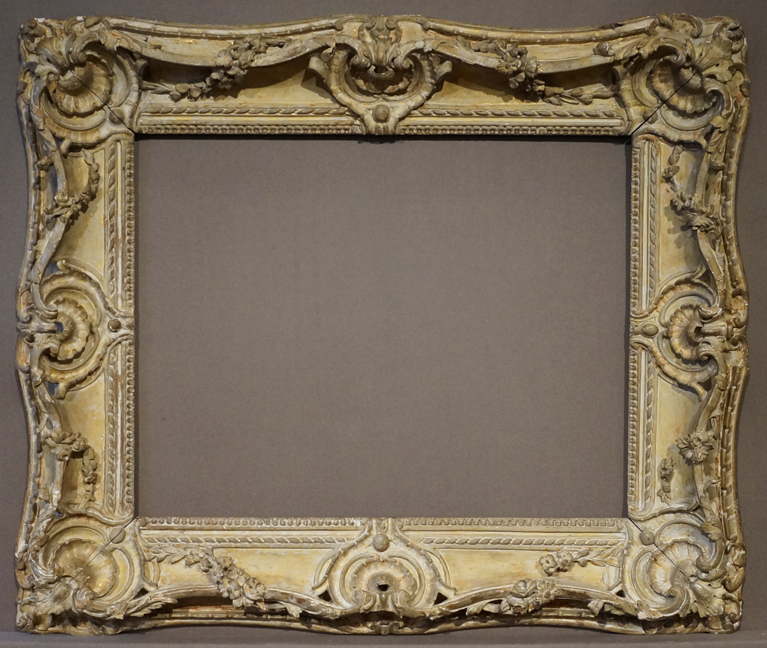 Wonderful small French frame in unusually perfect condition. Carved in walnut, it may have been made for a small Dutch painting (from an inscription on the back). 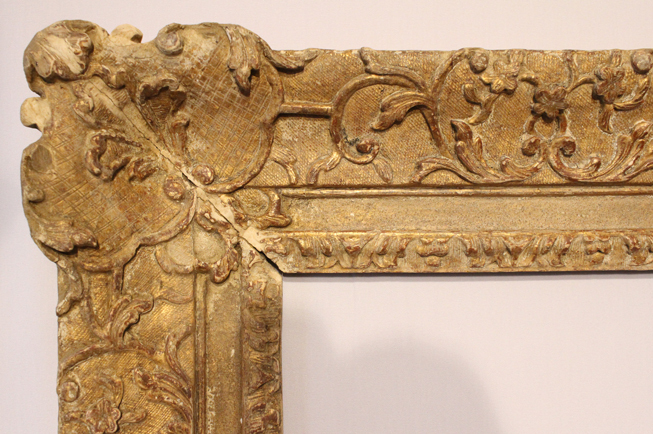 The frame has a fully carved, and rather delicate, sight edge and back edge and the elaborateness of the carving suggests it must have been made for an important house or even a royal palace. 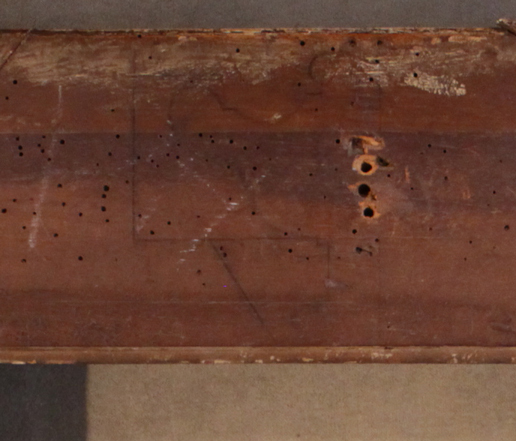 The frame has a little section drawing on the back — it doesn’t appear to be for this frame but for another one. A frame that I have had for some years, bought, I think from Timothy Newbery and then dry-stripped. A very unusual pattern with the lattice-work pattern in the hollow, all beautifully re-cut, French standard portrait size and very elegant. 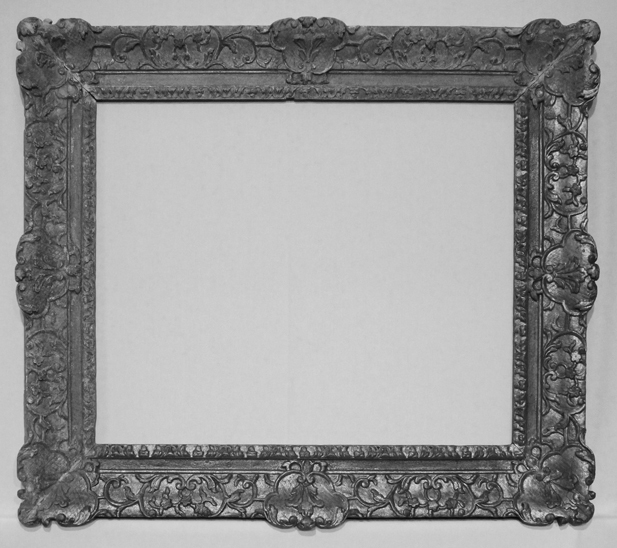 This frame is of a type known to framers as Bagard after the French sculptor César Bagard (1620-1709). Bagard worked in Nancy, in Northern France, and is known for his sculptures in bois de Sainte Lucie — a kind of cherrywood. 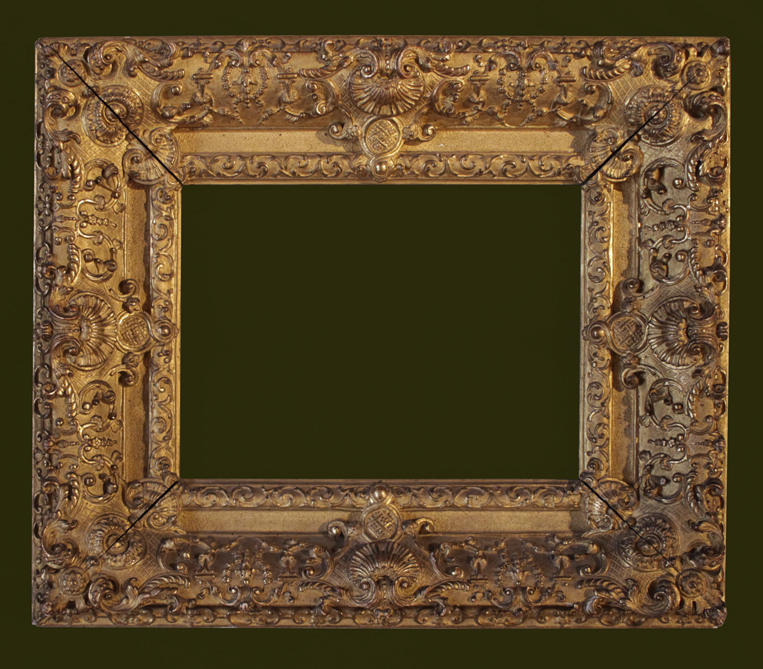 This frame is indeed made out of some kind of hard fruitwood — probably cherry and is typical in its ornament of a stiff acanthus leaf pattern on a reverse section frame. 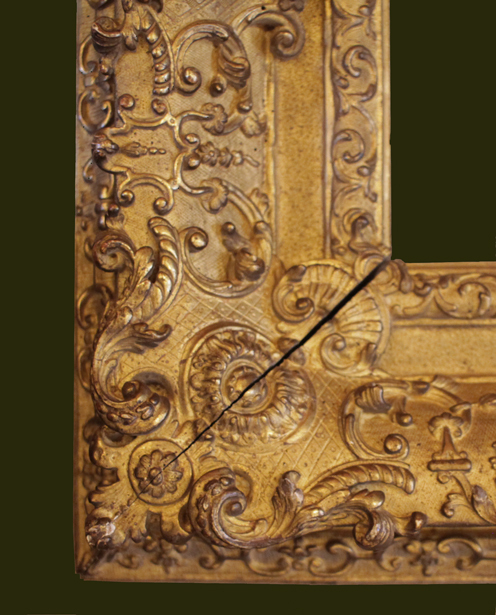 Here is a raking photo of a corner to show the section and a picture of the reverse of the frame, showing a half-lapped construction — if you look carefully at the sight edge along the top of the reverse you can see a little inserted repair. There is the same thing at the sides and at the bottom of the frame. 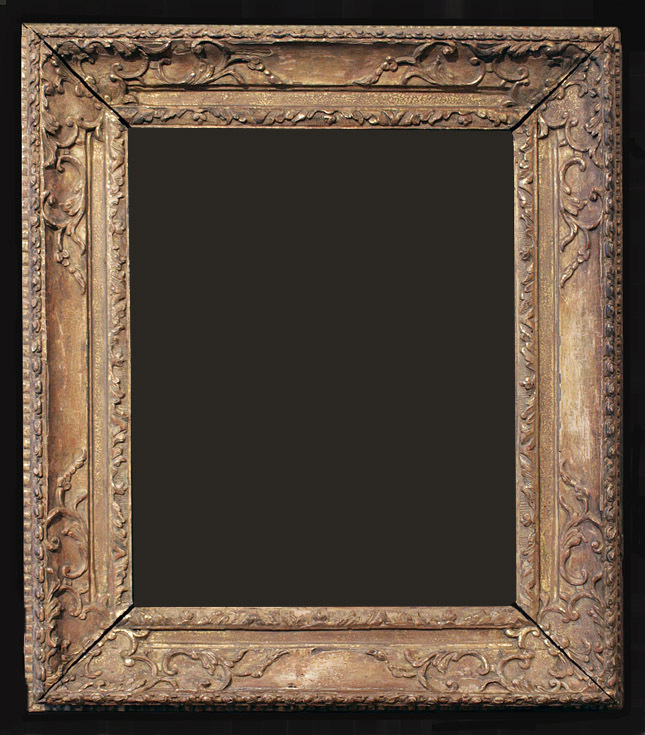 These frames were often used to frame carved crucifixes and perhaps this one once had a crucifix in it, most likely also carved from cherrywood. 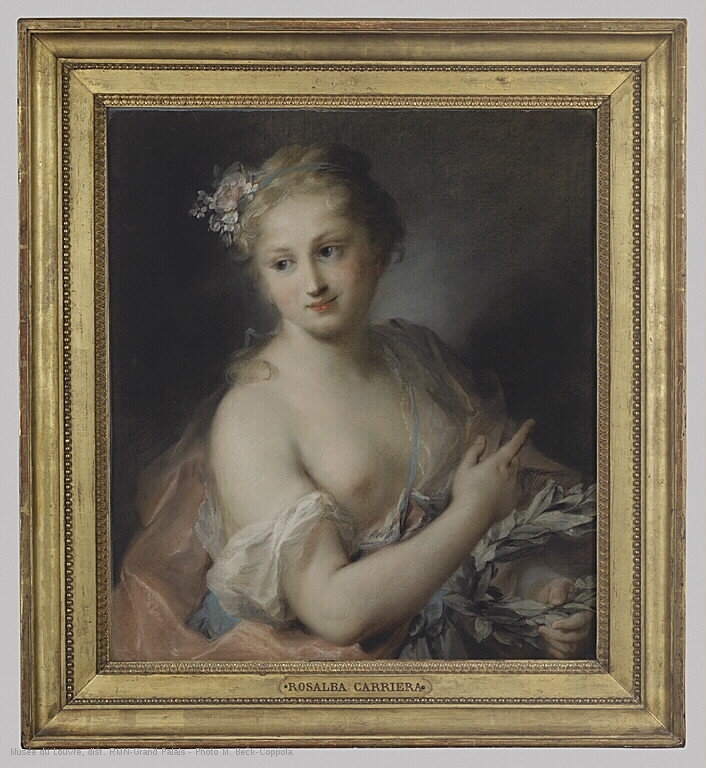 Louvre, Paris: Rosalba Carriera Jeune Fille Tenant une Couronne de Laurier. 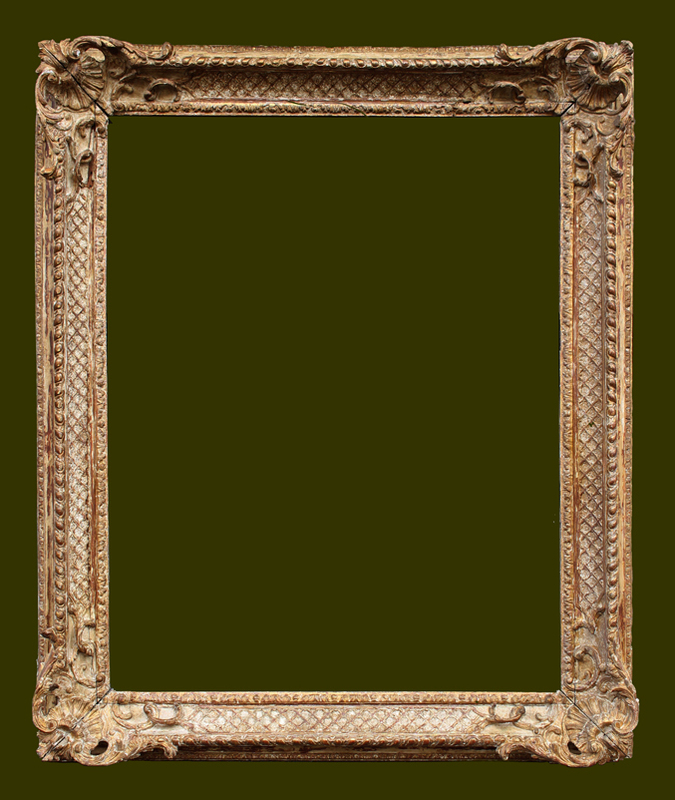 Louis XVI frame. 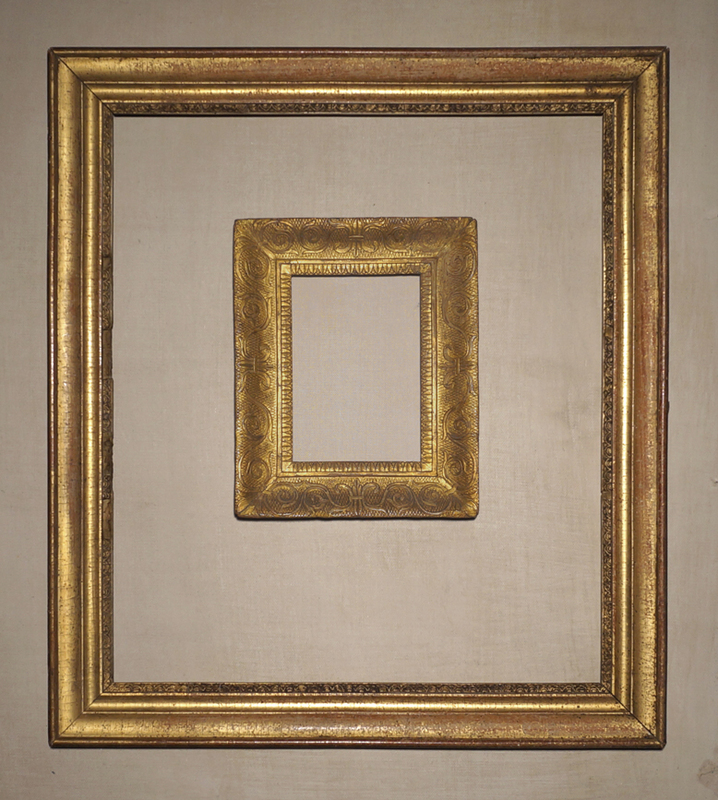 Good example of a simple Louis XV frame. 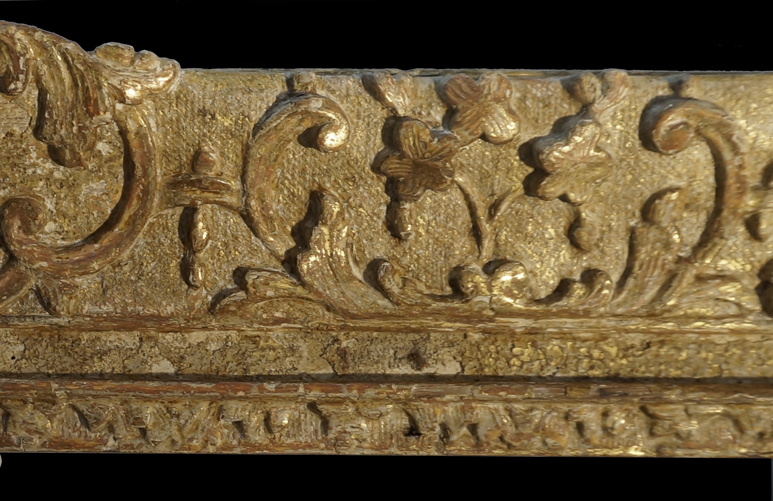 Note the re-cut sight edge ornament, the flattened shell motifs in the corners, and the shallow carved leaf ornament trailing from the corners. 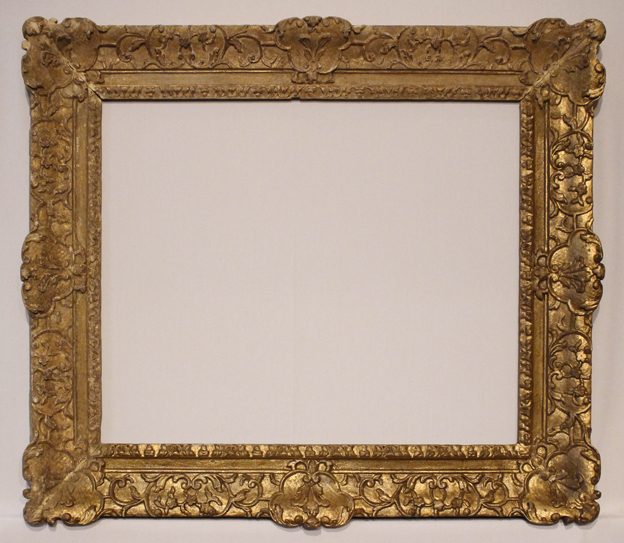 A lovely French frame, yellowy colour with much of the original detail retained. The French Transitional pattern is possibly the most developed of French generic frame patterns. The ‘transition’ is that between between Louis XV style, rococo/swept/full of movement and Louis XVI style with a change towards neo-Clasicissm, more stylised, less naturalistic and with elements from the neo-Classical repetoire of lamb’s tongue, ribbon twist and fluting. There is a label on the back of the frame suggesting that it had once housed a Degas painting of dancers. 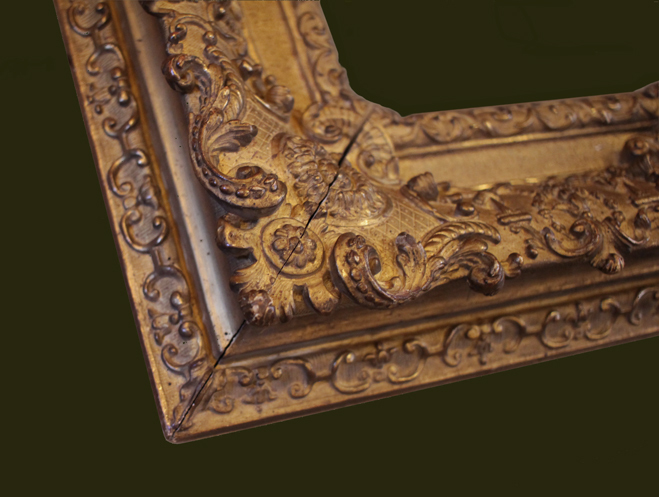 Clearly the gilding and red clay has been washed off this frame quite carefully, leaving traces of the original surface. 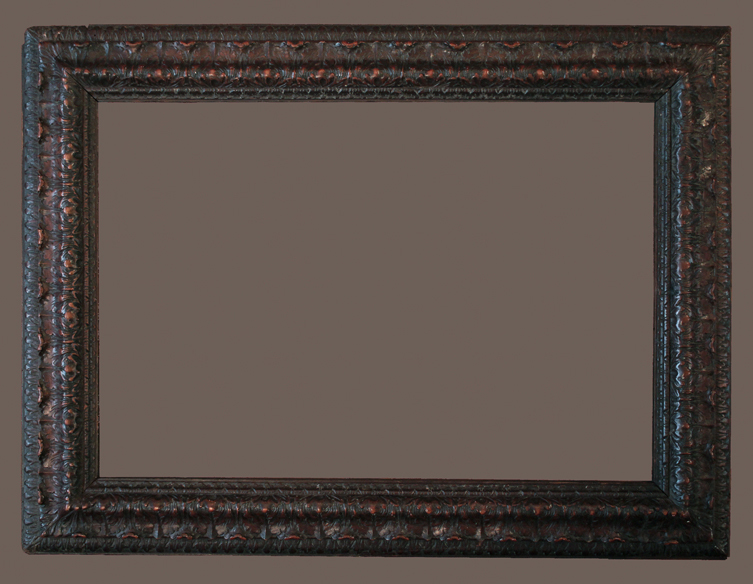 This is a finish that the French call decapé which is associated with the framing of Impressionist paintings. 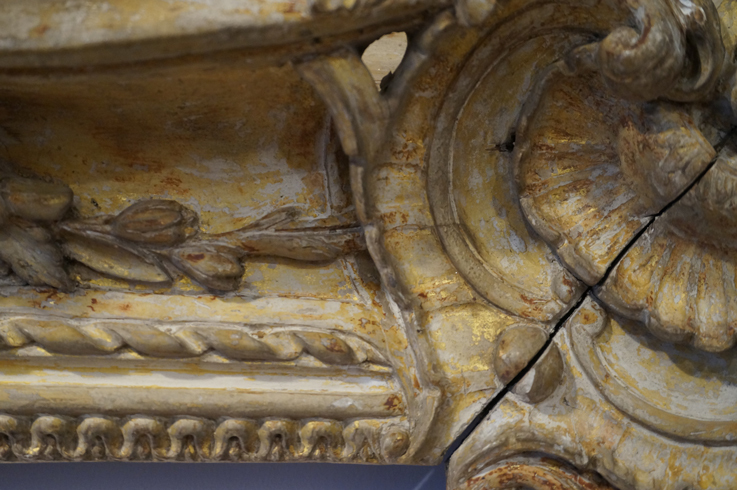 Corner detail showing remains of yellow ground, red clay and gilding on gessoed surface. 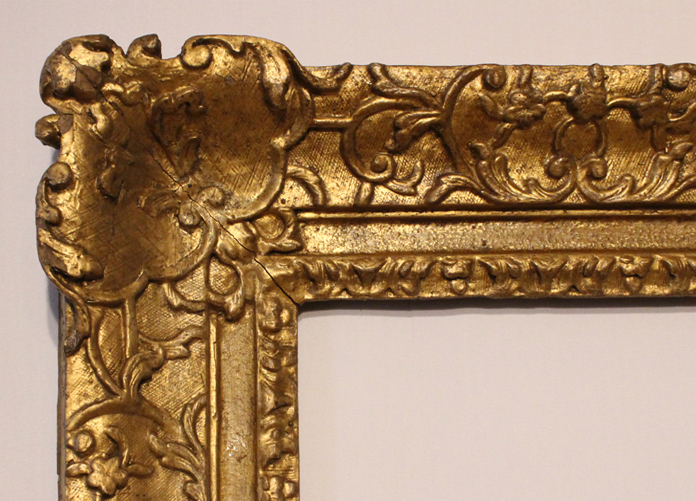 Below another frame of similar pattern, with original gilding. 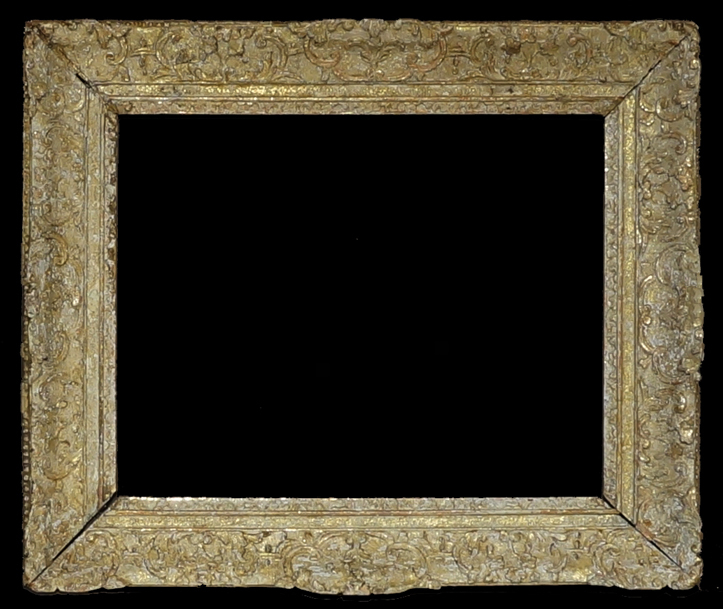 18C Louis XIV centre and corner frame, partially stripped. The same photograph but in black and white. 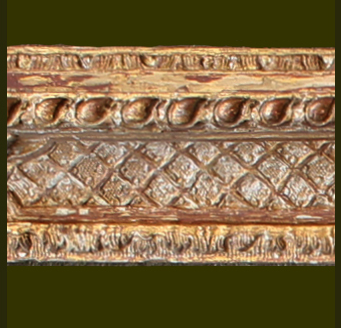 This shows more clearly the difference between the original surface (top and left) and the later oil gilded surface. I have removed later gilding from many frames over the past 20years but am still astonished by the difference a few microns of ill-conceived regilding can make — and not just to the surface of the frame but to the whole design of the thing which relies on the detail of the carving and recutting of the gesso — all lost. I am not sure why anyone ever thought this was a good idea but I am glad they did as it gives us a chance to remove it! Small French frame, lovely carving and surface — this photograph taken in low light to imitate candlelight, in which gilding is at its very best. 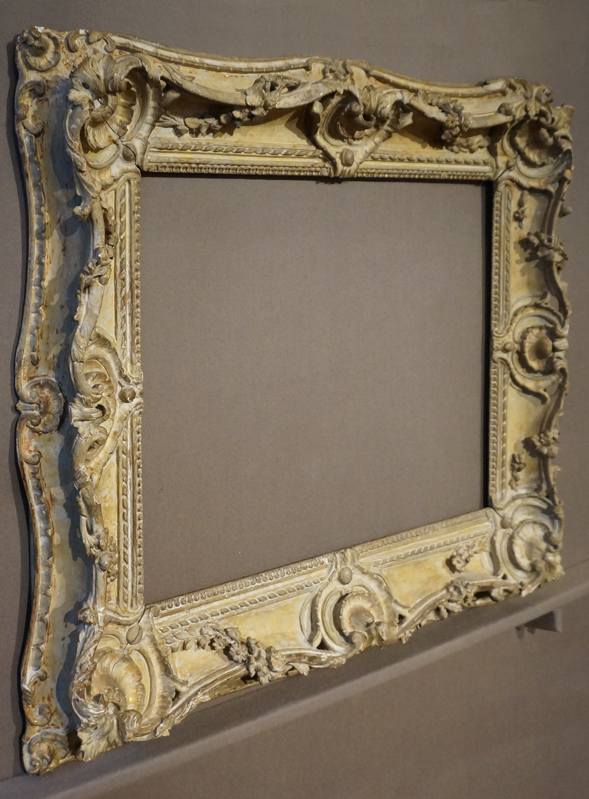 Lovely little French Louis quinze frame, recently dry-stripped to give a decappé finish. 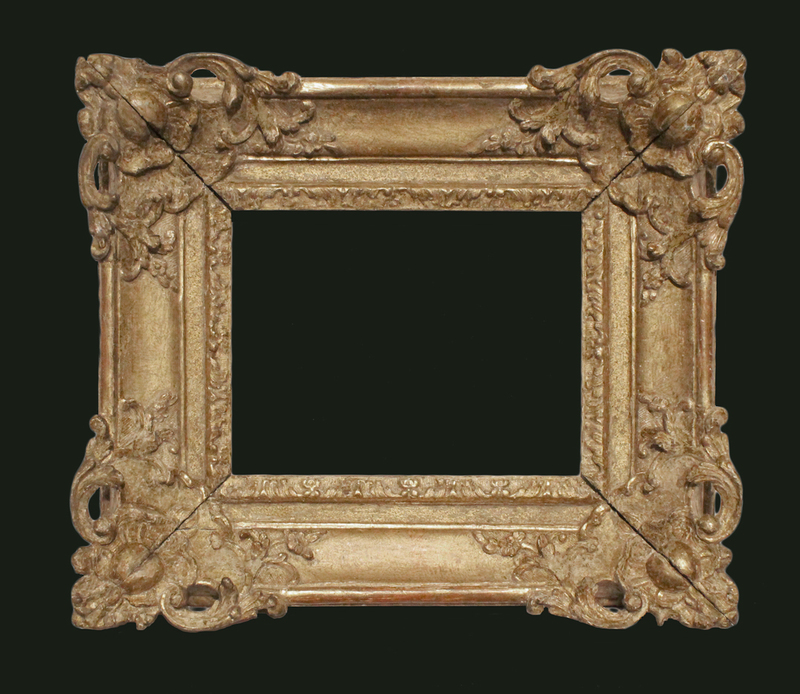 It is remarkable that so much work went into making something so small — the sight size is just over 8×6″ — the section, design, carving, re-cutting and gilding all done with the great craftsmanship that is so reliably typical of frames made in Paris in this period. This example needs some repairs, hardly visible in this photograph, but otherwise is all there. The finish is the result of ‘dry-stripping’ (picking off) a later layer of oil gilding laid on a thin coat of gesso. 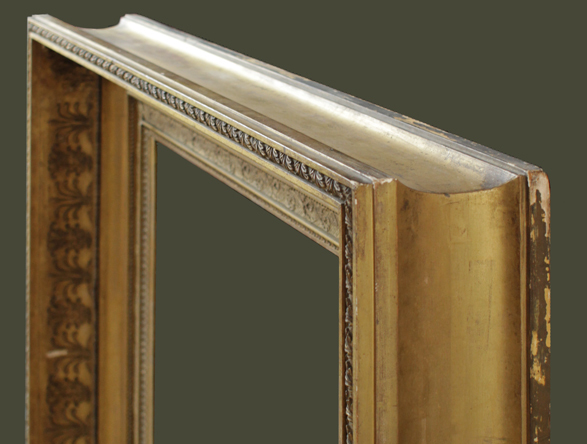 This oil-over-gilding of watergilded frames is often seen on French 17th and 18th Century frames that made their way to England in the 19th Century where a flatter, brighter finish was much more popular. It is a lot of work picking it off (about 60 hours on this small frame) but, I think, well worth the effort. 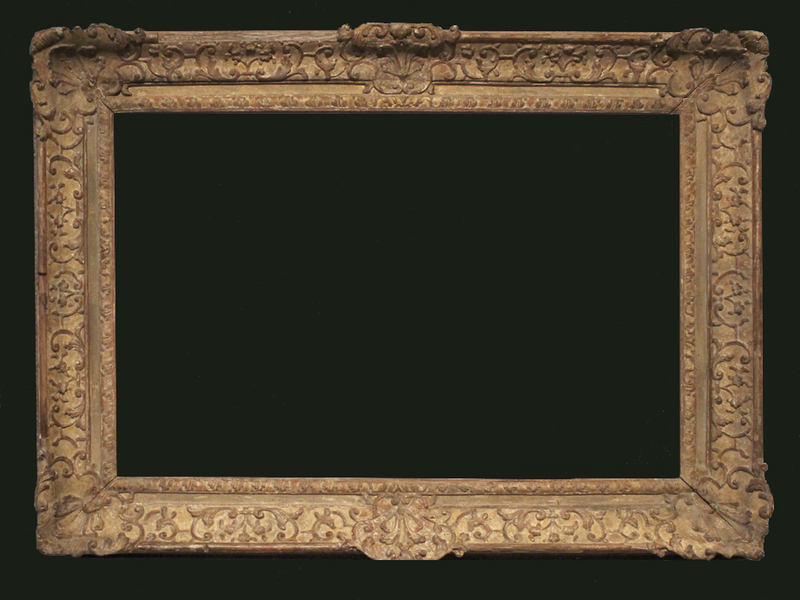 This frame has a blind stamp on the reverse with the makers name – E L INFROIT – which was required by French law. Other famous makers known by these blind stamps include Cherin and Pepin. 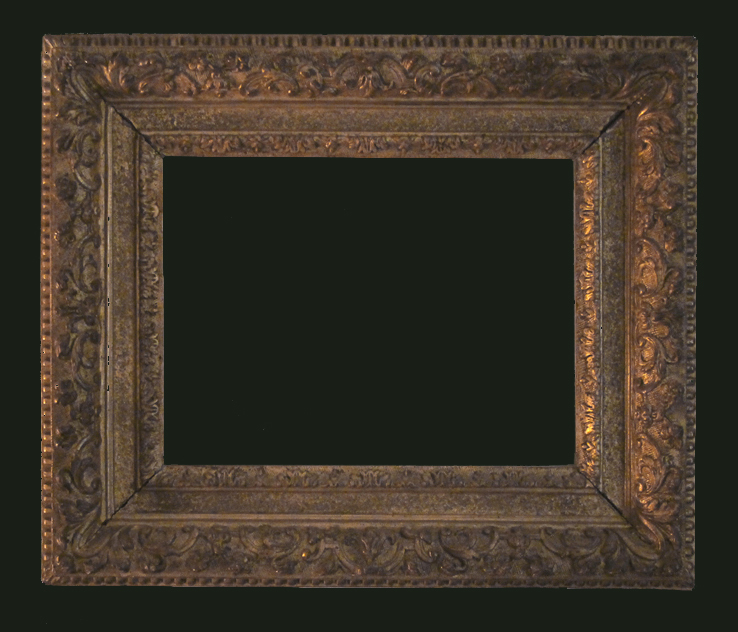 Two frames, the outer one is a French 19C moulding with composition sight edge, with a lovely speckled finish that one sometimes sees on frames of this type – not sure why it is, perhaps a deterioration of a top layer of animal size? The inner frame is a very specific kind of Italian 19C frame where the ornament is not carved in the wood but cut into thick gesso. The flat tops of the carving create an effect that catches the light beautifully.